AMHERST, Mass. – UMass used the long-range jumper to capture a 72-48 victory over Pacific in the first game of the fifth annual Gotham Classic at the Mullins Center. The Minutemen made 25 field goals in the game, 14 of which came from behind the 3-point arc. For the game, Massachusetts was 14-of-36 from three (both Gotham Classic records) and 11-of-19 from inside the arc in improving to 6-2 on the year. 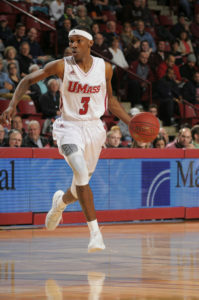 Donte Clark led UMass with 12 points. Luwane Pipkins netted nine points and the nation’s leader in steals added three to his total. C.J. Anderson, Malik Hines, and Seth Berger tallied eight points each, and Dejon Jarreau had six points, six rebounds, and eight assists. Pacific, which falls to 3-5, was paced by Ray Bowles and Jack Williams, each of whom scored 11 points. The Gotham Classic resumes on Saturday when Pacific hosts Rider. UMass next plays on Tuesday at home to North Carolina A&T.